Random Panel: Just remember, “crack is whack”, officer. 4 Responses to Random Panel: Just remember, “crack is whack”, officer. And why am I standing and not ducking? 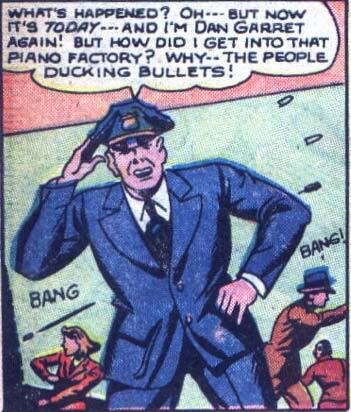 And, why there’s a man pointing a pistol at me. Why, he’s pulling the trigger, and, I seem to be in pain. Why, now I’m bleeding. How did I end up on the floor? Why, I’m losing conscious…. I’ve read a few Blue Beetle comics (mostly online) and this is by far my favorite story because of the dialogue explaining the time distortion.